On a bright morning in May 2005 in Landes on the current of Huchet, between the river mouth and the "pas-du-loup" island, I shot a movie which will be like those of the series of naturalistic journeys towards abstraction... 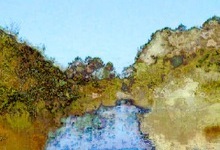 Along the current, the boatman leads us under the trees into the wildelife reserve's heart. The sun sticks the shadows of the flora onto the water. As we approach the banks, the elements of the flora stir from time to time. Nature and the image show themselves by impulse between the tall grass and the trees. The color begins to show itself. 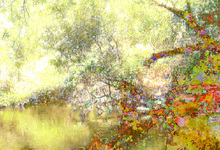 And then, rather fast, it is the whole landscape is transformed pixel by pixel to the rhythm of the compression’s spasms. 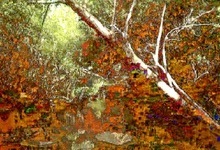 The colors change, everything begins to merge and to become abundant: trees, leaves, branches. Following the current, we put down the oars and... black. We are discovering what has just shown itself: the black is torn towards red, pink, purple, yellow and green... we find the current again, so quiet and peaceful. Rocked by the forest and its musical sounds, on the shivering water, it is the image which enchants us. It pierces the environment as if we could see magic composing shapes. Vivid colors, corresponding to another logic, work and expose themselves from green to pink. The sky is transformed, the image paints itself. Little by little, all the tones turn yellow. Sound: Isabelle Silvagnoli.